Diva Devotee: Bearded Diva Wins Eurovision Song Contest 2014! Bearded Diva Wins Eurovision Song Contest 2014! I didn't get a chance to watch Eurovision this year, but the few bits I did catch were amazingly staged. Copenhagen, you did good! I know the contest has always had the aroma of kitsch campness surrounding it, but even I was stunned to hear a bearded drag Queen claim the 2014 crown for Austria.The song itself was a little basic for my liking, but there's no denying the guy has a set of pipes on him- with some nicely held notes, and a steady vibrato on show on the night. 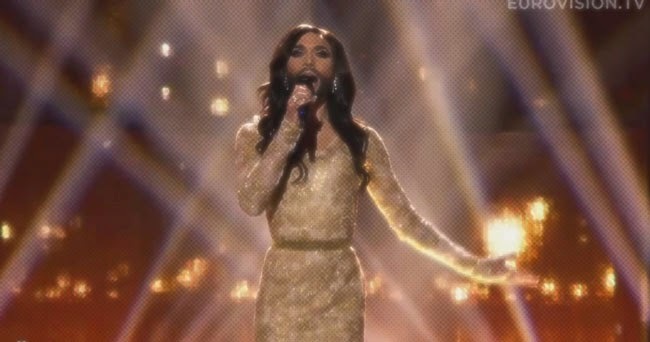 Check out Conchita Wurst perform the winning song, Rise Like A Phoenix, below. And if any of you did manage to catch the show, please point me in the direction of any standout performances from the contest in the comments. Wasn't a huge fan of this but thought Spain's Ruth Lorenzo was pretty good - a lot of vibrato going on but she's a vocal beast. Poland was actually very good in my opinion. My Słowianie/Slavic Girls by Donatan&Cleo. You should listen to this song. The Dutch entry which surprisingly came in second was pretty decent. Although not awe inspiring singing. I also think that second place was greatly aided by the fact that they sang as third before the voting. It was funny to me but when I heard it first I thought they didn't sing very well together and I didn't rate the female as being very good. Turns out, that was last year's entry Anouk's arch enemy. As for the bearded drag act. Found out everything is a complete gimmick. a purely on the stage act so to speak.Which means I am already over it. It now bums me out , the no doubt substantial portion of his votes being "sympathy votes". Couldn't stand his sickly submissive behavior either. But he can sing and the song was decent. And the 12 points by countries like the Ukraine and Georgia WAS rather surprising. I loved concheta , song concept was a little tacky but definitely a strong performer and message , I do however completely agree with opie that it feels put on and gimmicky after knowing it's not a real persona. Being a male makeup artist and follower of countless drag queens it's a tad annoying that this was all an act. But as I said all power do them and I'm glad it was a LGBT positive message, for reffrance if your looking for true drag acts who can sing I suggest you check out Vicky vox,Courtney act and adore Delano . Just FYI regarding positive LGBT message. I think Dana, who is for real so to speak, is a positive message. I am on the fence how positive this act is. Btw all three Israeli winners in ESC history were LGBT. Thought most of the performers were pretty weak tbh. Austria kinda deserved the victory. Sweden was fine too. On another note, Belgium ended up being last (or close to it) of the first semi-final. Awesome. lol Eurovision is centred around gimmick. literally, it's the most kitsch who wins. criticism on gimmick and vapidness are sorely unfounded and baseless. that's like trying to find subtlety and substance in an X-factor show. Oh I absolutely love it when you have a huge variety of beautiful female names and you still choose the name such as Conchita. LOL. It's so disappointing to read it was an act. I wonder how it would have done without the gimmick. You know I wouldn't mind so much about this guy- after hearing it was a put on for the show- if he just said he wanted to wear a dress for his performance. But the "drag queen" descriptor goes a lot deeper than just a dude wearing a dress. In fairness though, I'm not sure if it's the media that has given him that label, or if it's something he's been spreading himself. Let me add those videos to your comment!